Fernando De Noronha South Atlantic Ocean. This is a scarce 1953 U.S. Air Force aeronautical chart or map of the Fernando De Noronha Archipelago off the coast of Brazil. It covers the Archipelago, a UNESCO World Heritage Site since 2001, and its surrounding seas and notes hydrographical and topographical features essential for the air pilot. Verso of this chart features legends and a world aeronautical chart index. 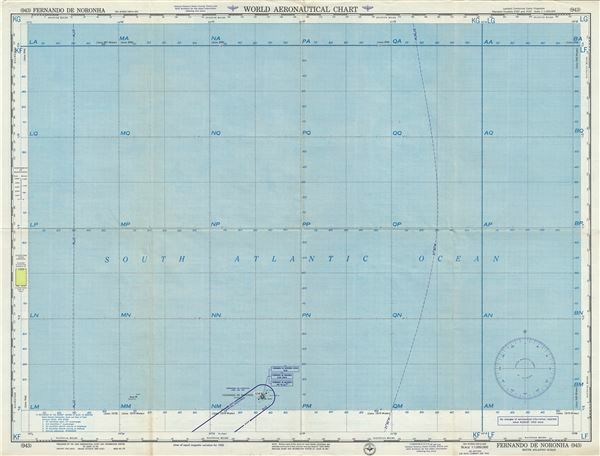 This chart was published by the USAF Aeronautical Chart and Information Center, and was issued as chart no. 943. First issued in 1946, this is the fourth edition revised to Feb 1953.